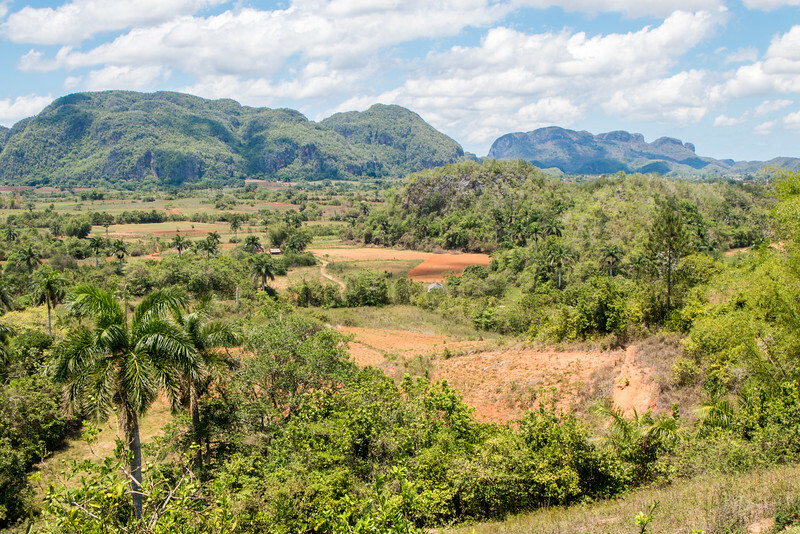 Valle de Viñales is a real Cuban gem. 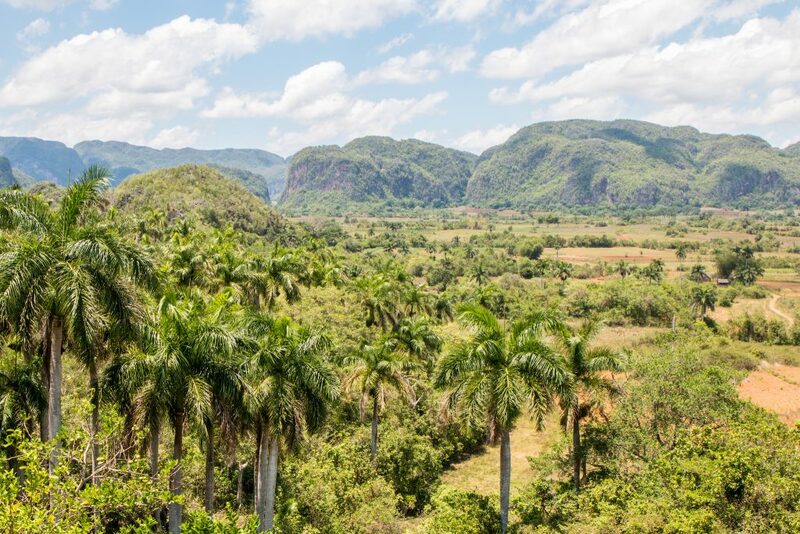 Best-known for its plantations that grow the world famous Cuban tobacco, this valley in the Sierra de los Organos has a lush karst landscape surrounded by mountains that blew us away the second we arrived there. The mogotes (limestone outcrops), basically hills that pop off the ground of the valley, can reach up to 300 m and are one of the features that make the landscape of Valle de Viñales unique. The other is its rural environment. The valley is dotted with farms and its fertile red soil is suitable for all kinds of agriculture, where traditional methods and techniques are used and part of the authenticity of Viñales. Due to this, Valle de Viñales was selected as UNESCO World Heritage Site and, later, turned into a National Park, Parque Nacional Vinãles. 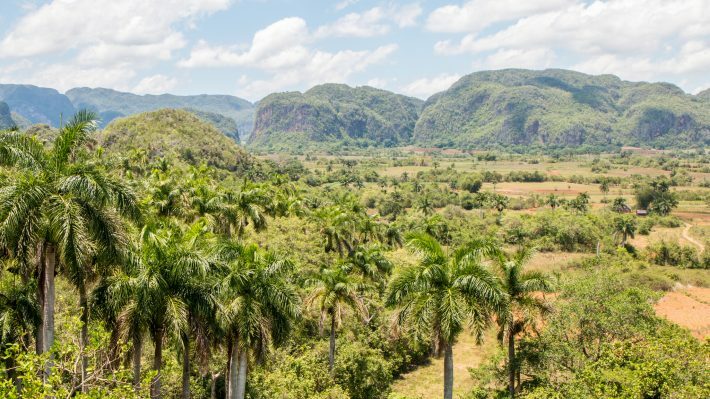 Valle de Viñales is located in the province of Pinar del Rio, on the westernmost part of Cuba, almost 200 km away from Havana. 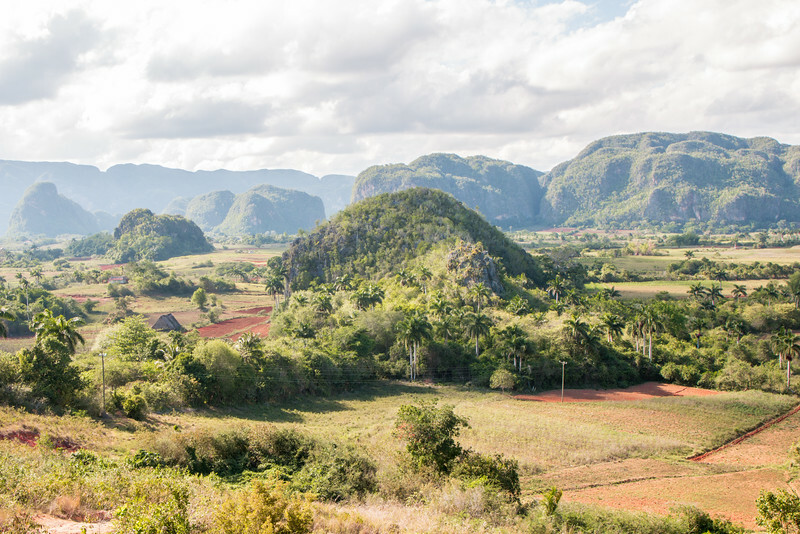 We visited Viñales after a couple of days in the capital and on our first day of driving in Cuba. This was where the adventure began! There are quite a few activities that can be done in the valley. We spent a day there and could have stayed longer, but rest assured that the highlights can be seen in a day. 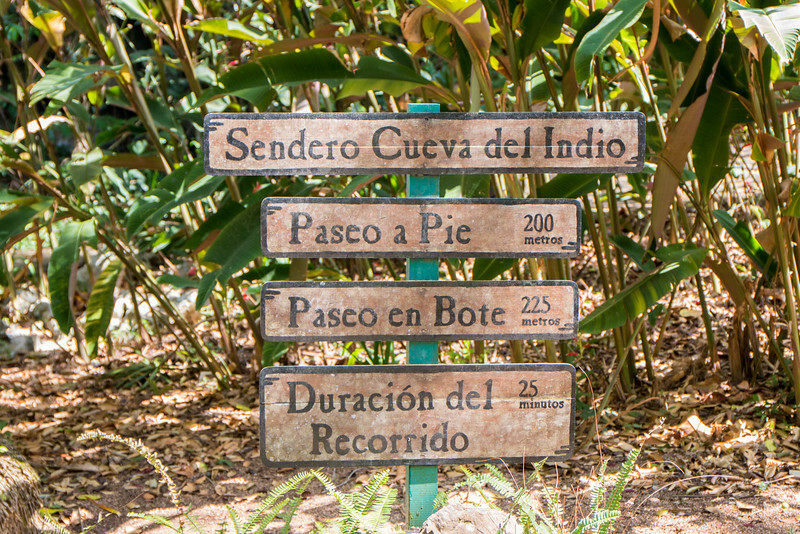 Popular activities include visiting a tobacco farm, going inside a cave under a mogote, horseback riding and hiking. Well, and smoking, if you’re into those things. The National Park office on the road south of the valley has more information on the available activities, hiking trails and how to hire a guide – which is necessary for some, yet not essential for the majority. The small town of Viñales is located in the valley and the main street is lined with nice looking one-storey houses, of which most are casas particulares or restaurants. We arrived in Viñales on the 1st of May, which is a day of celebration in Cuba – 1 mayo/día de los trabajadores (workers day). Lots of people were on the street and music was being played at the town’s square. One important thing to note is that day tours from Havana are very popular, but because it takes a while to get there, early mornings and from mid-afternoon onwards are the best times of the day to visit the valley. 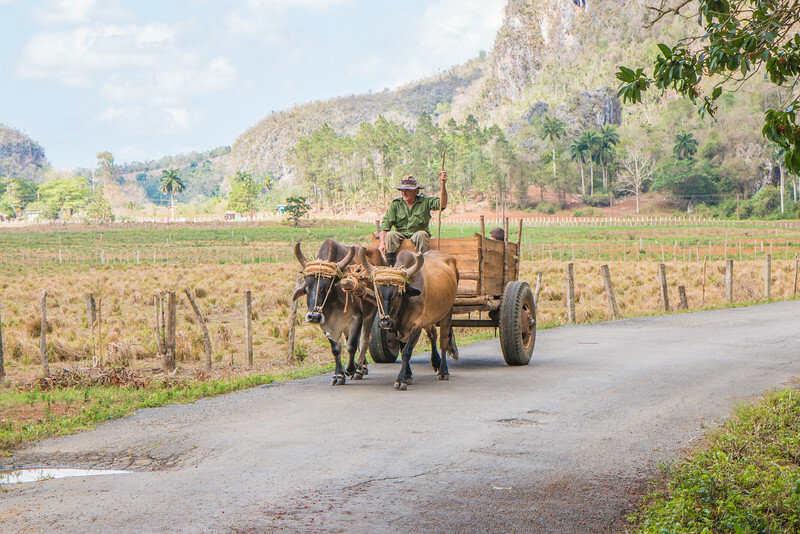 Like we mentioned above, Valle de Viñales is a very rural area with a considerable number of farms. 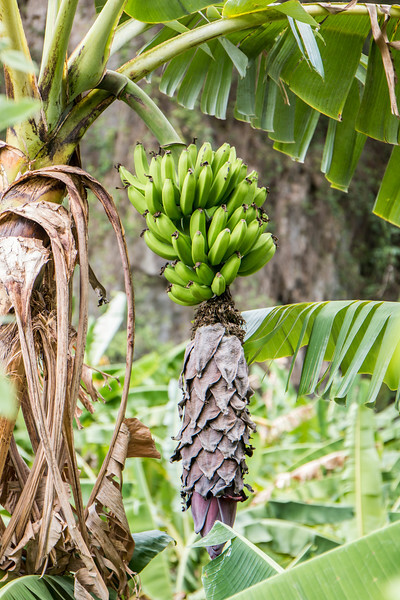 Agriculture is the valley’s main economic activity and the quality is top notch, not only of tobacco but also fruit and veggies. Some farms also have livestock. Organised tours will take you to a specific tobacco farm to check out how things work. Instead of doing so, we decided to do things on our own and stopped by a few farms to see the daily life of Cuban farmers, including the tobacco curing barns. We even engaged in some chit chat with some of them and they were very curious about what brought us all the way from Europe to see Cuba. 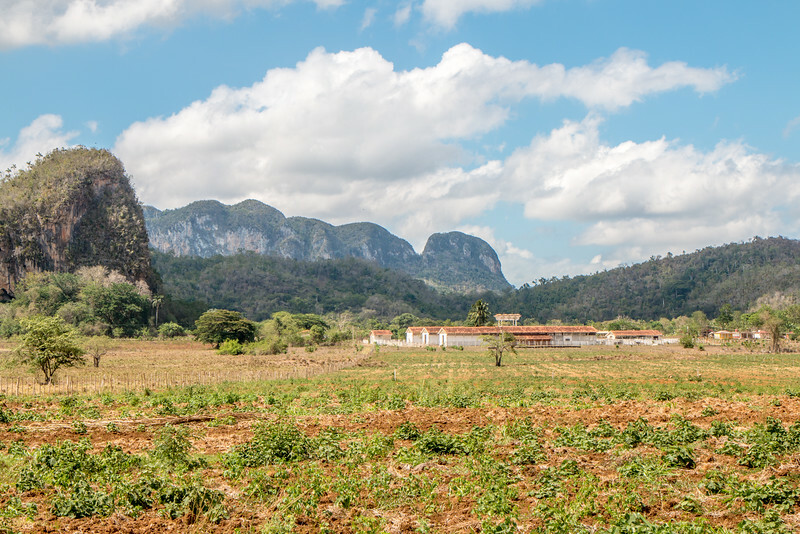 The scenery with a farm on the foreground and mogotes and mountains to the back is well worth the trip all the way to this part of Cuba. We can’t stress enough how good fruit is in Cuba. It’s impossible to count the number of mangos and other fruit we had while there. Simply delicious. And the juices? So refreshing! Valle de Viñales is full of caves and some are open to the public. We visited two, Cueva de San Miguel and Cueva del Indio. Cueva de San Miguel (also known as Palenque de los Cimarrones) is quite small and it even has a bar by the entrance. It doesn’t take long to visit and you’ll be invited for a drink. Cueva del Indio is a bit more interesting. Its best feature is the underground river, making it the only navigable cave. It starts with a short hike and then a boat takes you further into the cave and then out. It was quite nice. Another big one is gran caverna de Santo Tomás, which requires a guide and we didn’t have time to do it. If you’re interested, it takes around 90 mins to visit 1km of the cave, the part that is open to visitors. 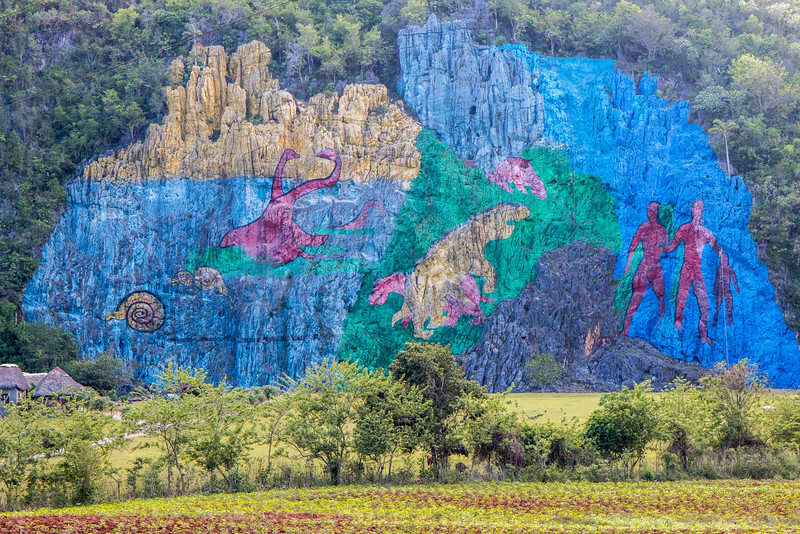 Probably the strangest thing we saw in Viñales was Mural de la Prehistoria. It’s a massive painting on the face of a mogote that depicts animals and the evolution. It’s quite the odd sight. The valley is best viewed from above and the mirador (viewpoint) very close to the National Park office on the road south of Viñales is the place to go for some stunning vistas. Park by the office and take a gentle walk up the hill past a few houses and you’ll reach a café/restaurant. This is the place. It has some wooden verandas with an incredible view and it’s the ideal place to enjoy drinks and a snack. We stayed there over an hour as the sun was starting to fade away. With time to spare there are a few options to visit outside Valle de Viñales. These are recommended if you’re staying extra days. The city of Pinar del Rio, the capital of the province with the same name, is located only 30 km away from Viñales and has a few interesting buildings and museums. It’s also a good place to stay overnight. On the downside, it’s the hustlers (jineteros) capital of Cuba – annoying folks. Soroa is home to an immaculate orchid garden, which houses one of the world’s biggest collection of such flowers. Great place for photography. Parque Nacional de la Güira is also a nice place to visit. It has expansive gardens, including both an English and a Chinese garden. For some beach time, Cayo Jutías and Cayo Levisa are the best options, although other less known beaches exist along the coast not too far from Vinãles. Don’t forget that the Cubans are extremely friendly and will gladly suggest other interesting things to do in the area. Did you know about Valle de Viñales? Would you visit this Cuban gem? What a unique adventure in Cuba! I love the mural, the views and that you pointed out the perfect place to admire the sunset. There’s so much to see on the island! Contrary to what most people believe, Cuba has a lot of places to visit. 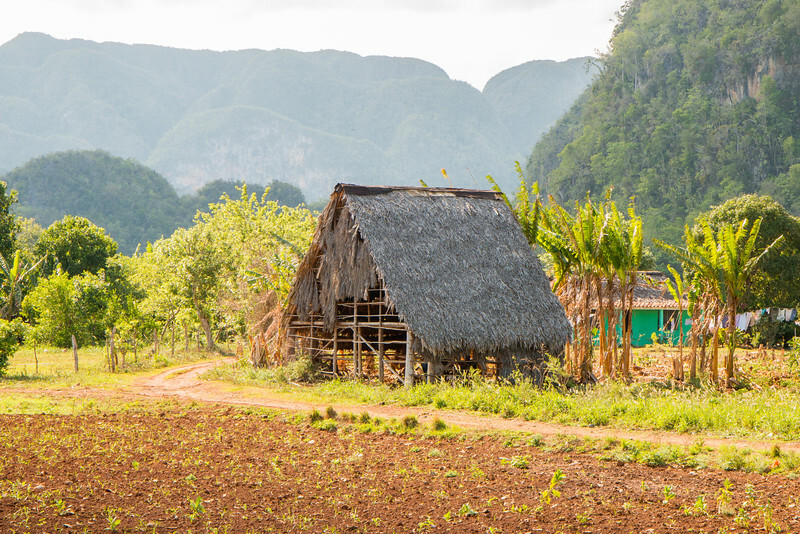 Viñales being one of the most popular outside Havana and Varadero. It’s very different from Havana. It’s just a small town surrounded by magnificent nature. The old cars are there but we decided they were not important for this article. Vinales sounds like such an amazing region. We definitely want to go back to Cuba to explore more of the country. When we do, we will be adding Vinales to our road trip itinerary. Good tip on how to avoid tourists arriving from Havana! There’s a lot to see there. 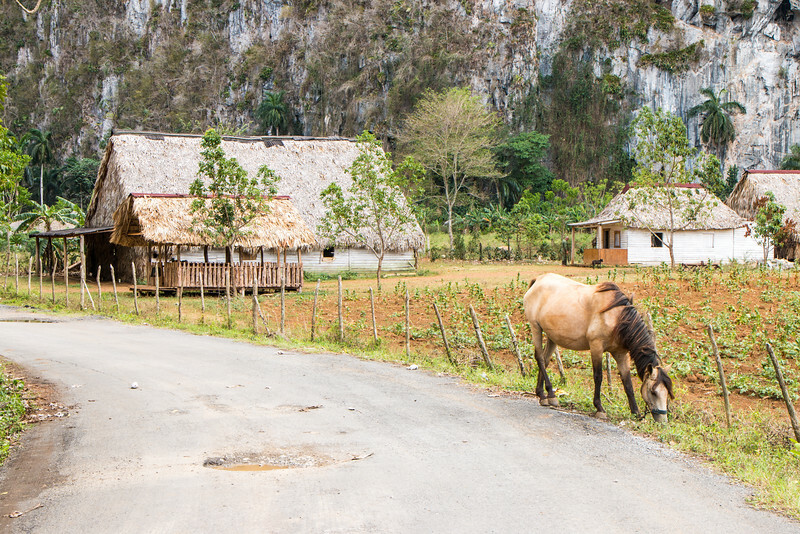 If you do make it back, Viñales should definitely be on your to-do list. While I don’t have an interest in the tobacco itself the beauty of the area and the traditional farming is fascinating. The caves sounds fun too, would have to take a look at those. We went there not because we’re into smoking but mostly due to the landscape and the rural environment. Not many pictures from the caves because it’s quite difficult to photograph due to the lack of light. True, Holguin is a bit too far. Here’s a great reason to return to Cuba! I’m sold. Valle de Vinales is a national park. I would love to go explore the caves. A cave with a bar shouldn’t amazing. What a beautiful and unknown part of Cuba – I’ve read so much about the major destination towns so it’s great to read about other parts of this amazing time-capsule country – and the caves sound so interesting! I’m really hoping to get there before it is changed too much my Western influences! Indeed beautiful and unknown. There’s a LOT to see in Cuba. It won’t change considerably in the near future. Definitely worth going! First of all, that mural is beyond phenomenal! I love rural places like this, they are definitely considered gems in my book. Everywhere seems to be a breath of fresh air, and every corner is picturesque in its own rustic way! Yay! One more vote for the mural. 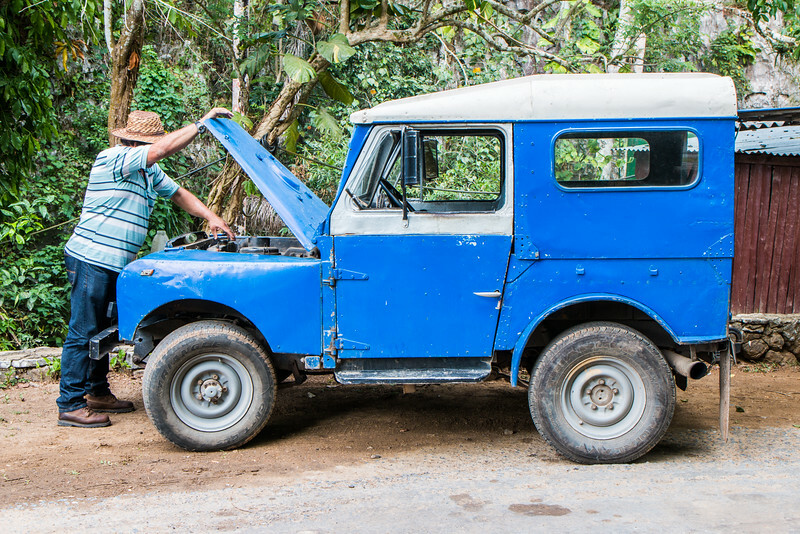 The rural part of Cuba is by far our favourite and we highly recommend it. Oh Cuba. I was there 7 or 8 years ago and I loved it. But unfortunately I stayed at one of those all inclusive type resorts and I didn’t get to experience the fullness of the country. Now that the borders are open I feel that the “uniqueness” of the country will slowly disappear. I hope to go before that happens by mass tourism. No worries, it will take a long time for it to change, if at all. They need a better economy and more tourists but also need to retain the Caribbean and colonial feeling. That’s what attracts people to this lovely country. Staying in a resort limits your options, but the beaches are great! Yes, it’s fairly different if compared to the image most people have of Cuba. And there’s more places like this, more nature focused and really nice to visit. Cuba looks amazing. Can’t wait to finally be able to travel there some day! Thanks for the great post. You’re very welcome. It is an amazing place to visit! This blog is totally awesome. Thanks for sharing!